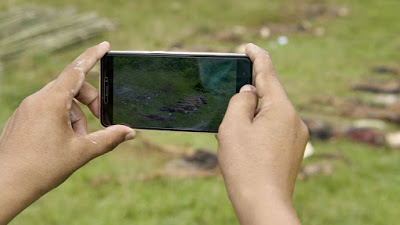 A MAN TAKES PHOTOS WITH A MOBILE PHONE OF THE DEAD BODIES IN YEBAWKYA VILLAGE, MAUNGDAW ON SEPTEMBER 27, 2017. MYANMAR'S ARMY SAID ON SEPTEMBER 24, 2017 IT HAD DISCOVERED A MASS GRAVE CONTAINING THE BODIES OF 28 HINDUS, INCLUDING WOMEN AND CHILDREN, IN VIOLENCE-WRACKED RAKHINE STATE, BLAMING THE KILLINGS ON MUSLIM ROHINGYA INSURGENTS. CREDIT: STR /AFP/GETTY IMAGES. The Associated Press on Thursday published an exclusive report that adds to a catalog of horrors in Myanmar. The news agency confirmed the presence of at least five previously unreported mass graves filled with the bodies of Rohingya villagers. This counters the Myanmar government’s line that it is only fighting Rohingya insurgents and that such massacres are not taking place. Yanghee Lee, the U.N.’s special envoy on Myanmar, responded to the report that the months-long military operation against the Rohingya has “the hallmarks” of a genocide” — but wouldn’t say it outright. Bangladesh and Myanmar have signed a deal to repatriate Rohingya refugees who fled the conflict, but neither government has offered details on how the Rohingya will be sent back home safely when their villages have been burned down and even at the best of times, they were living under apartheid conditions in Myanmar. The United Nations and the United States got around to calling the operation “ethnic cleansing” in the fall, but have thus far avoided saying it rises to the level of all-out genocide. Genocide is defined as acts “committed with the intent to destroy, in whole, or part, a national, ethnical, racial or religious group” and is a crime under international law. Ethnic cleansing is the “rendering an area ethnically homogeneous by using force or intimidation to remove persons of given groups from the area.” It is not in violation of any specific international law. “It’s disappointing that this has been called the most egregious example of persecution, ethnic cleansing, even of genocide in the world today, and yet, there does not seem to be much attention being given to it,” said Robert Marro, director outreach in Washington for the Burma Task Force. “Even people like Bill Richardson resigning from the commission and criticizing Suu Kyi is not making headline news,” he told ThinkProgress, adding the fact that so little attention is being paid in general to the situation is “very disappointing,” especially given that the crisis is ongoing. “We’ve been saying more months and months that are all of the signs are indicative of some kind of genocide going on.” Marro said that all of the group’s field research indicates that the number of those killed is “substantially greater” than official estimates. He added that he’s not surprised that these graves were discovered and is certain others will be found.